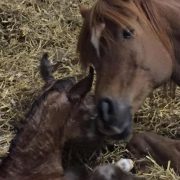 Our wonderful leasing mare FT Ingrid (Yllan el Jamaal x India Reyna) gave birth to a stunning colt by the ONE and ONLY Lawrence el Gazal. We kind of had hoped for a super colt as he would make a great contribution to Naphis Arabins breeding program. He is exactly what we hoped for from this combination.